We have had two sets of special visitors the last two days and we were thrilled to see them. Monday the Walley family from Pastor Scott Morris' church in Richton, Mississippi came to see us. 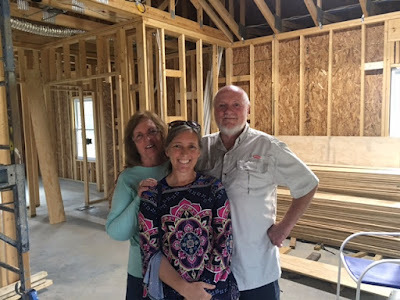 They are on vacation and planned time to stop in and see the progress on the house. Some of you may remember that Bro. Sheldon Walley came with Bro. Scott to help frame the house the last week of May. They worked two long days on the framing of the house and were a great big help. You can read about that week and see pictures HERE. They text me Saturday night and told me they would be in the area Sunday and wanted to stop and see us. We were out of town preaching so they shuffled their list of things to do and came in on Monday. They stayed long enough to eat a bite of lunch and drink a little salsa with us at Acapulco. They had to move on that evening but we appreciate them driving out of their way to see the house and us. It was very thoughtful of them and may God bless them for it. Tuesday evening Kelly Jo's parents came to see us. We were just finishing our work on the house as they arrived. Kelly Jo and Odie gave them the nickel tour while I finished up. They have been covered up with medical stuff and then threw moving in on top of all that. This was their first chance to see the progress on the house. They were glad to see it and we were happy to have them here. They came to celebrate Kelly Jo's birthday so we ate a late supper with them and enjoyed their company for as long as we could. Today is another day of work.